These guys look a lot better without the chest caps. The proton packs and belt equipment had to be moved around a bit to maintain all the proportions, but I think it looks good. I have discovered what I think will be the hardest part of this image for me. 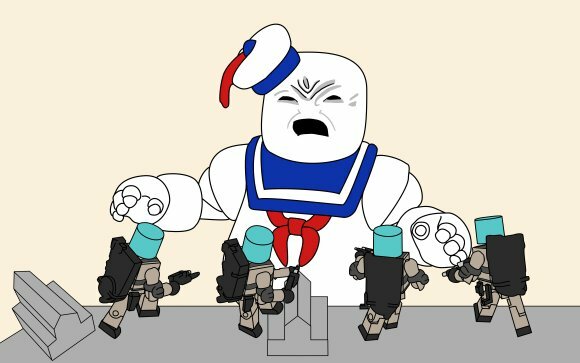 Stay Puft's face is really giving me troubles right now. 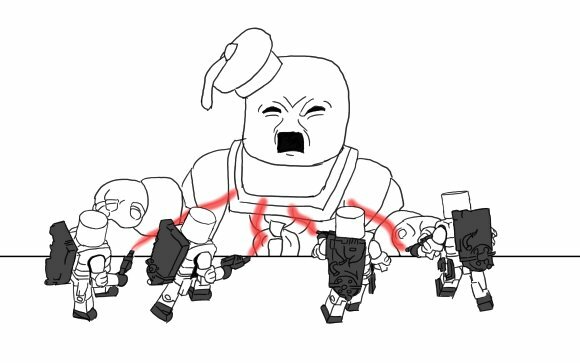 I really want that angry "You shot me!?!" expression, but all my attempts end with poor results. What you see above is the best I've come up with so far. I think I'll let that part sit for a whlie and work on the background and hairpieces for the guys. I'll probably finish out the proton packs first. That's a solid goal I know I can accomplish. I think I've decided on an alternating big post-little post type format. Today is the little post with a preliminary wallpaper design featuring the new Ghostbusters Minimates. I threw it together pretty quickly to just get a feel for how the Minimates should be layed out. It's a good first start, but needs a lot of work. I'll move the ledge closer to the Ghostbusters and probably swap the two leftmost. I'll probably crop it a bit tighter too. Anyway, I'll probably be showing these in-progress shots as the 'little-posts' for a couple weeks. As long as I don't find some extra time and complete it all this weekend. Unfortunately Stay Puft doesn't look angry, just old and tired.